We had so much fun visiting Europe last year that we decided to book another Globus tour this year. This time we booked the Irish Escape, a 7-day tour of the Republic of Ireland that begins and ends in Dublin. Globus Escapes are a great introductory tour that visits many of the highlights associated with the tour’s given nation(s). We elected to travel in off-season again, March in celebration of my 60th birthday, as the prices are much reduced. Shortly after leading an Austrian Army to a remarkable victory over the Turks at Zenta in 1697, Prince Eugene of Savoy purchased a large plot of land outside Vienna. Eugene plan for the property included palaces and gardens. Johann Lukas Hildebrandt was selected as the project’s lead architect. Setting on a slope, the property rises gently from the front. Plans called for two palaces. The first, smaller palace, was built on the front (or lower part) of the property with a larger palace occupying the upper end. A large garden would stretch between the two palaces. Construction of the Lower Palace began sometime before 1712, and the Upper Palace was completed in 1723. Artists commissioned to work on the project include: painters Marcontonio Chiarini, Francesco Solimena, Carlo Carlone; and sculpture Giovanni Stanetti. Michael Korda, Journey to a Revolution: A Personal Memoir and History of The Hungarian Revolution of 1956. (New York, NY: HarperCollins, 2006). In this instance Korda’s subtitle accurately captures the appeal of this work. Journey to a Revolution is both a memoir and a history, blended in a way that makes the narrative live. In a mere two hundred and five pages Korda retells an adventure in which four young Brits (author included) ran headlong into the Hungarian Revolution of 1956. Squeezed into a VW, the four friends traveled from England to Budapest to deliver medical supplies to a Budapest hospital and to bear witness to a great event. Budapest is a beautiful city. It was the first city on our tour and it did not disappoint. We loved it; the sites, the people, the culture. This group of photos are of Buda Castle. Unfortunately, we were not able to see the interior of St. Matthias Church because we visited on Sunday morning. We toured with Globus Tours and found them to be excellent. Our group had a great time. One of the “Little Stalins” installed to power in the wake of the Red Army’s march toward Germany during the closing months of World War II, Mátyás Rákosi certainly shared his sponsor’s brutality. Crude in his behavior, a trait he nurtured as a badge of his lower-class status, Rákosi helped fashion Hungary’s Socialist catastrophe. Employing identity politics and “salami tactics” Rákosi slowly sliced away all those opposed to collectivism. Fear, intimidation, and death were considered necessary tools in his effort to build a classless society. From his rise to leadership in 1945 to his forced exile in 1956 hundreds of thousands of Hungarians were either imprisoned or executed. This is a great blog. So many stories. Please, check it out. 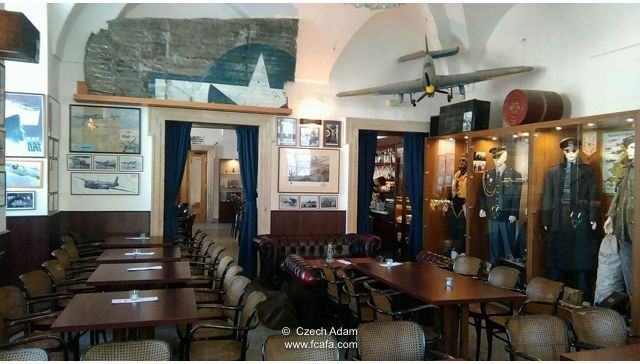 For Czechoslovak RAF airmen relatives and enthusiasts, a key location to visit when in Brno is the Air Café. Pro všechny příbuzné letců RAF a také jejich sympatizanty, kteří navštíví město Brno, je nemyslitelné, že by nenavštívili jejich kultovní místo – kavárnu Air Café. Air Café origins go back to 1999 when brothers Albert and Adam Kronek began to develop their seemingly simple idea of combining the atmospheric environments of gastronomy and honouring the Czechoslovak airmen, who fought in the RAF during WW 2 in Great Britain in one establishment. The walls are decorated with numerous photographs of the airmen, posters, aviation artifacts and the glass display cabinets show many of their personal belongings which all have various connections to the four Czechoslovak RAF squadrons. On the occasion of our Thirtieth Anniversary, Mrs. Present and I traveled to Europe. We visited Budapest, Vienna, and Prague. It was remarkable. I will be posting highlights from the trip. Most posts will consist of short histories and a lot of photos. I will go in depth on others. First up: St. Vitus Cathedral in Prague, CZ. King Charles IV of Bohemia (later Holy Roman Emperor) began construction of St. Vitus Cathedral in 1344 AD. Two previous churches had existed on the site, the first being built in 925 AD. Construction of St. Vitus was lead by Matthias of Arras until he died in 1352. Peter Parler then assumed the role of head architect. Construction and restoration efforts continued until 1929, when the Cathedral was consecrated. © History Present and historypresent.com, 2016-2019. Unauthorized use and/or duplication of this material without express and written permission from this site’s author and/or owner is strictly prohibited. Excerpts and links may be used, provided that full and clear credit is given to History Present and historypresent.com with appropriate and specific direction to the original content. For additional permissions, contact History Present.